Jamie Donaldson is delighted with his form going into this week's Ryder Cup. 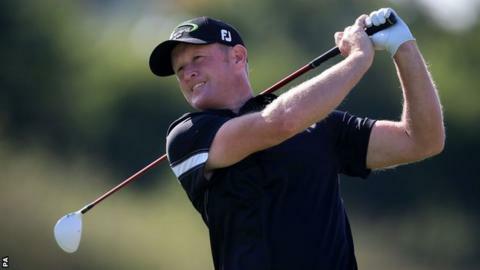 Although he failed to become the first Welshman to win the Wales Open on Sunday, the 38-year-old was encouraged by his fourth-place finish. Donaldson finished on 12 under par at Celtic Manor, two shots behind winner Joost Luiten of the Netherlands. "It was a good, solid week and I played nicely every day, I couldn't have got much more out of it if I'd tried," Donaldson said. "The form has been running well for a while now, so it was important to keep playing well up until the Ryder Cup even though I got in a month ago. "I played well from the start, had a great chip in on the third after another shot spun off the green and then made a great birdie on four after bogeying the second. "That got the wheels running in the right direction and I played really solid after that. I was totally happy with the way I played." Donaldson will become the first Welshman to play in the Ryder Cup since Phillip Price helped Europe to victory in 2002, having sealed an automatic place in this year's European team after a fine season. "It's been on my mind for the past six weeks I suppose but you try and focus on the tournament at hand," Donaldson said. "But I'm looking forward to it... looking forward to travelling up tomorrow [Monday]. "I'm very excited, it'll be a very enjoyable week." The 2014 Wales Open was the 15th consecutive year the tournament has been held at Celtic Manor, but a new staging deal has not been signed and the tournament will not take place in 2015. Hotel owner Sir Terry Matthews has bemoaned the event's position in the golf calendar, pointing to this as a major reason why the Wales Open has sometimes struggled to attract the world's top players. But Donaldson praised the venue in Newport, south Wales, which hosted the 2010 Ryder Cup. "I think it's excellent, I love coming back here to play and it's a shame it probably won't be here next year, but I'm sure Mr [sic] Matthews will bring the tournament back here in a few years," Donaldson added. "The course is a tough golf course, it's much harder than it used to be when it was up in the hills a bit more... it's a very good test of golf."